Eliazar has been spinning tunes around the globe while collecting tunes on his travels here and there since the tender age of 14. It all began with a high school radio station in the outskirts of Chicago (WDGC) with roots in Punk, Industrial, and New Wave . The inevitable procession learning of all types of music has kept him roving bins of record shops everywhere he turns. Moving with over a metric ton of vinyl records has been gradually shifting to a more digital age, as so much of the good music coming out from around the world will never find itself on wax. 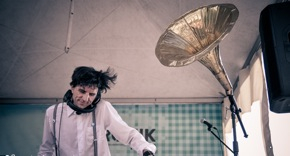 DJ Eliazar is the founder of the Speakeasy Electro Swing nights in Montreal, which have now spread all over the world with Speakeasy nights happening in NYC, Vancouver, Seattle, Portland, Austin, Houston, Mexico City, Oklahoma City, Oslo, Barcelona, and Leeds. 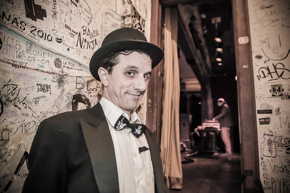 These nights have been at the forefront of the Electro Swing and Electro Blues sound in North America and beyond. He compiled and released Vol. 1 of the Speakeasy Electro Swing compilation in April of 2013, the first Electro Swing compilation out of North America… Volume 2 came out in September and features the Electro Vintage style of tunes which includes Electro Swing along with Electro Blues and Gospel groovers as well. From residencies all over the globe - Tocca a Te (Osaka), Ultra (Hiroshima), Heaven (Christchurch, NZ), Crush/Holocene/Aalto/Nightlight/Goodfoot (Portland, OR), Rialto (Long Beach, CA), Divan Orange/Sala Rossa/Blizzarts (Montreal QC), and gigs in places as diverse as Tokyo, Chang Mai, Punta Cana, Turks and Cacaos, Chicago, Vancouver, Minneapolis, LA, Victoria, Seattle, Bristol, Berlin, Montreal, etc, the sound has spread far and wide. Eliazar has also been doing radio ever since those high school days in Portland (KLC, KPSU, KPRA) Victoria(CFUV), Tree Frog Radio(Gulf Islands, BC) and a variety of online and pirate shows. Tracks have been made and released under the names: EQ! (with Joselito Sering), Nomadic Noize, Snowballs(a full band with Shayla Hason, JT Weber, and Joe Partika), Mushroom Lounge(with Levon Louis), Stab Ability(with John Hill), and now Eliazar. The productions have always had a link to sounds recorded on the global travels and try to bring a new take on differing styles of blips and bleeps. Always striving for his own style and groove you can expect to hear a totally eclectic array of tunes in each mix, from Electro Swing, Electro Blues, Gospel, Dub, World Beats, Ghetto Funk, Balkan, Bass, Middle Eastern, Brazilian, Hip Hop, Soul, Funk, Jazz, Electronica, Downtempo, Indie, Punk, etc. The ethno - groove-mesh is always changing form, shape, and aural colour as each new style of music is discovered, dug, and new influences and tunes are found. Always interested in what the world has to offer, Eliazar is up to dance all night, and cause you to do the same.